The reproductive host list for tree species affected by the polyphagous shot hole borer has topped 35 species as of March 2015. This list includes species that are capable of successfully growing the fungi that cause Fusarium dieback, and supporting reproduction of the polyphagous shot hole borer beetle, as confirmed by UC Extension Plant Pathologist Dr. Akif Eskalen. Why is that important? Even though another 200+ species may be susceptible to Fusarium dieback, and may even be killed by it, these species are the ones that are capable to spread the pest to new areas, and managing this disease complex relies on stemming that spread. It's extremely important to monitor any of trees of these species that have an active infestation, and make sure to remove wood that is an active source of the beetle, whether by removing branches, or the entire tree. The list includes 13 species native to California, including all of the major riparian tree species found in the southern region - this is where it's most likely to cause significant ecological damage. It also includes many of our most common street and residential trees, as well as a high value agricultural product, avocado. There are also two common and problematic invasive species on the list, castor bean, and tree of heaven. This may seem like a silver lining, but because these species are so widespread, they may be active agents in vectoring the pest to new areas. 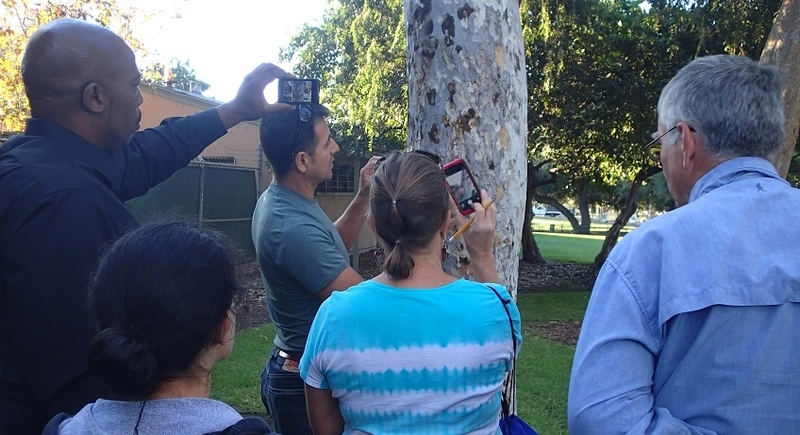 Below, UC Extension Plant Pathologist Akif Eskalen trains crew for PSHB identification in the lower Arroyo Seco.